Internationally-recognised certification body Chartered Institute of Marketing (CIM) has rebranded with a new ‘future-fit vision’ and announced a three-month research program it is calling a ‘hackathon’. The UK-based CIM, which has been running for 104 years, certifies marketing qualifications in Australia through the Australian College of Marketing. The organisation undertook a 12-month extensive research and consultation process in order to redesign its brand vision, in consultation with its thousands of members, marketers, senior business leaders and its own staff. 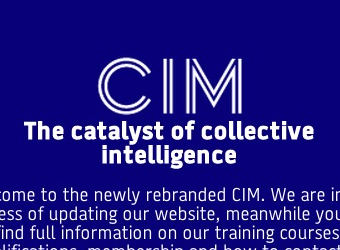 CIM’s new brand role is as ‘the catalyst for collective intelligence’ as an active participant in, rather than simply a voice for, discussions on the marketing industry. International brand strategy agency Brash Brands redesigned the brand’s visual identity from its red and black design featuring a crown to a minimalist blue wordmark. Aa part of the new strategic direction for CIM, it has announced the ‘The Marketing 2025 Hackathon’, which it describes as ‘the largest conversation in our history about our future’, to run over January to March 2015. The project will aim to gather collective insight from marketers and business people globally, exploring key themes, predictions and challenges and aiming to develop and implement solutions to marketing issues. CIM chief executive Anne Godfrey says the hackathon will bring together the ‘best and brightest’ marketing thinkers to address issues encountered from rapid changes to the industry. “A brand’s identity shouldn’t be based on popular opinion, consensus, the whim of a creative director, or the views of a biased marketing director,” he writes. “Rather, brand identity is the creative translation of strategic intent – the visual and verbal manifestation of who we are, our values and our future vision for the brand. “To bring our heritage into the forefront of our brand, we set about re-crafting our crest to tell its story more effectively,” Brown explains. “We took inspiration from brands such as The Royal Mint, The Old Vic, Gieves and Hawkes, The Goring, KLM and Royal Mail to understand how to modernise without losing its integrity. “Royal blue as the lead colour, reflecting our values of intelligence and authority, our collaborative aspiration and, in particular, our Britishness (key to our heritage and particularly important in international markets). “Aqua is our disruptive colour; it represents clarity and creativity and – as a more dynamic colour – can balance the strong nature of royal blue.